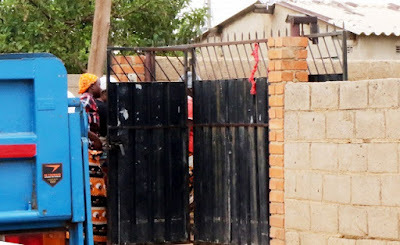 A COMMUTER omnibus driver from Bulawayo’s Pumula South suburb allegedly murdered his wife before committing suicide following a domestic dispute on Tuesday afternoon. Mlungisi Moyo (40) allegedly strangled his wife Thandiwe Sibanda (33), a nurse, with a wet towel before using a piece of wire to hang himself on the roof trusses of their bedroom where he had locked the two of them inside as they fought. The incident occurred at the height of 16 days of Activism against Gender Based Violence whose aim is to promote peaceful relations between men and women. It is alleged that the couple started fighting around 3PM and when the noise died down, one of their five children called out to them but did not get a response. One of their neighbours reported the case to the police who attended the scene after 7PM and removed the bodies towards midnight. Yesterday neighbours were still in shock over the incident with relatives claiming to be in the dark over what could have led to the tragic deaths. A Chronicle news crew arrived at the house around 11:30AM yesterday and found both the Moyo and Sibanda families discussing the matter. Moyo is said to have left a suicide note. “He wrote that both of them should be buried at their rural home and they have a funeral policy which will take care of the expenses. “Police have also encouraged us to work as a unit,” a relative was overheard saying. A family spokesperson who identified himself as Mr C Moyo said the families had no idea what caused Moyo to kill his wife and later commit suicide. “We don’t live here and we only came after learning about this tragedy. We don’t know Mlungisi as a violent person. This could just be a dark cloud over this family,” said Mr Moyo. One of their neighbours, who is also a pastor at a local church Apostle Nehemiah Madzivanyika, said he learned about the tragedy after one of the deceased couple’s children raised the alarm. He said the child approached his family informing them that his parents who had been fighting in their locked bedroom, were no longer responding. “I sensed that something bad could have happened so I decided that we drive to Pumula Police Station and report the matter. After reporting, police officers accompanied us. They had to break the door and the woman’s strangled body was lying on the bed while he was hanging from the roof trusses,” he said. Apostle Madzivanyika said the couple was having serious domestic problems and Sibanda was on the verge of leaving Moyo. He said she had already sought a protection order against Moyo who she said had threatened to kill her. Apostle Madzivanyika said last Friday Sibanda left her matrimonial home and returned to her family in Nkulumane. He said she only returned on Tuesday, the day of the tragedy. “We’re told that Moyo called her saying the children wanted to see her but when she arrived he locked her in the bedroom and killed her before killing himself. This is a very sad situation. They had scheduled a counselling session with me today but unfortunately Moyo could not be patient,” he said.